CHANDIGARH, SEPT 21 :Panjab University today honoured its medal winners at the World University Shooting Championship held at Bydgoszcz, Poland from September 14 to 18. PU Vice Chancellor Prof Arun Kumar Grover and Maharaja Ranjit Singh Chair Professor at PU Lt. Gen. KJ Singh (Retd.) honoured the medal winners Vinita Bhardwaj, Ajitesh Kaushal, Milanpreet Singh, Anjum Moudgil and Namanveer Brar. The coach and the manager of the Indian team Mr. DS Chandel and Dr. Amanendra Mann were also honoured on the occasion. PU Dean Students Welfare Prof Navdeep Goyal, Director PU Sports Dr Parminder Singh and officers of University administration and sports department also participated in the felicitation function. PU student Vinita Bhardwaj won individual gold medal in Air Rifle Women Individual and one gold medal in Air Rifle Women team event. PU student Anjum Moudgil won the Individual Silver medal in 50 Mtrs. Rifle 3 Position Women event. Ajitesh Kaushal, Milanpreet Singh were part of the gold medal winning Indian team in 25 Mtrs. Standard Pistol Team and Air Rifle Men Team respectively. Namanveer Brar was the member of Bronze medal winning Indian team in Trap Men Team event. World Shooting Championship. Out of these 9 Shooters are studying in PU campus and its affiliated colleges. Lt. Gen. KJ Singh and PU VC Prof Grover congratulated the students for bringing laurels to the University and the country. They motivated the players to work for the next Olympic games. Badminton championship at Russia were also honoured. 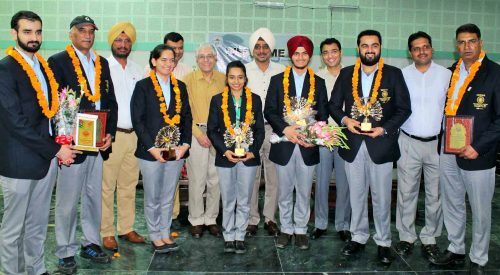 The PU Canoeing & Kayaking (Men & Women) team members, who won a number of medals at the All India Inter University Canoeing & Kayaking (Men & Women) Championship were also felicitated.